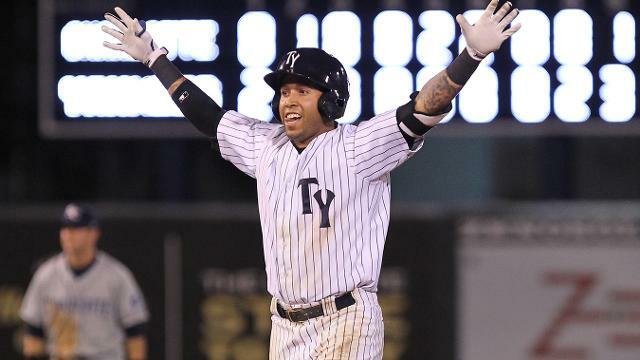 TAMPA, Fla. - The Tampa Yankees (29-30) rallied for five late runs in a 7-6 final over the Charlotte Stone Crabs (28-29) on Wednesday night at George M. Steinbrenner Field. Cito Culver crushed a two-run double to left field, driving in the tying and winning runs in the bottom of the ninth. The T-Yanks started the night on the right foot by scoring twice in the first inning against Charlotte starter Leonel Santiago. Jake Cave hit a leadoff triple and later scored on an RBI sac-fly by Zach Wilson. Greg Bird drew a one-out walk and advanced to second on a passed ball by Stone Crabs catcher Maxx Tissenbaum. Danny Oh later drove in Bird with a single, giving Tampa a 2-0 lead. Marty Gantt gave Charlotte a quick answer by hitting a solo home run off of LHP Dan Camarena in the second. The Stone Crabs grabbed a lead with a two-run fifth. With runners on second and third, Charlotte tied the game on a wild pitch by Camarena. An RBI single by Leonardo Reginatto later put the Stone Crabs ahead, 3-2. RHP Alex Smith relieved Camarena with two outs in the sixth and inherited the bases loaded. Smith allowed a two-RBI single by Julian Ridings, giving Charlotte a 5-2 lead. Camarena allowed five runs on seven hits in five and two-third innings. The southpaw walked one and struck out three in the no-decision. Santiago pitched a season-high seven and two-third innings for the Stone Crabs. The righty allowed two runs (one earned) on three hits and two walks, tallying a season-high six strikeouts. Tampa sparked a two-out rally against reliever Jose Molina in the eighth. Culver reached on an infield single and advanced to third on a double by Greg Bird. Zach Wilson then singled to right, cutting the deficit to 5-4. RHP Nick Rumbelow worked a scoreless eighth before allowing a run to Charlotte in the ninth. Tommy Coyle reached on a fielder's choice and stole second. A two-out RBI single by Reginatto gave the Stone Crabs an insurance run. Down 6-4 in the bottom of the ninth, Jose Toussen led off with a single to right. Trent Garrison worked a 3-2 count and drew a walk, placing the tying run on base. Molina continued to strike out both Cody Grice and Claudio Custodio. Down to his last strike, Cave slapped a 1-2 pitch into left field, scoring Toussen. With runners on the corners, Culver stepped to the plate and delivered the walk-off double. Rumbelow (4-0) earned the win after allowing a run on three hits in two relief innings. The righty walked one and struck out three. Molina (3-3) blew his fourth save attempt after surrendered five runs on six hits in an inning of work. The southpaw walked one and struck out two. Wilson went 1-for-3 with three RBI for Tampa. Bird reached base three times and scored twice, going 2-for-4 with a double and a walk. The series continues with a 7:00 p.m. start on Thursday. LHP Miguel Sulbaran (0-1, 5.02 ERA) will start for Tampa. Southpaw Blake Snell (0-1, 4.50 ERA) gets the start for Charlotte. On Throwback Thursdays, presented by 98.7 The Fan, fans can enjoy throwback prices, such as reserved tickets for $2 and general admission for $1. $2 draft beers, $1 sodas and half price nachos will be available from 6-8:00 p.m.